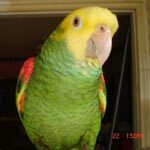 Parrot Forum • View topic - Hi all! I'm from East Tennessee with my new baby senegal, Rex! My fiance and I also have a dusky conure named Kaddy! We will be checking in and reading up on training tips and tricks! Our guys are super cuddly and sweet, we want to give them the best life possible! Welcome to the forum. I really like the last line of your post. Welcome to the forum, Lynx, Rex and Caddy! Please do not start formal training until the bird is a juvenile because you can't restrict food with them and they need to be properly socialized before they start 'going to school'.